On Deck is Metro Atlanta's Best Sports Memorabilia Store! 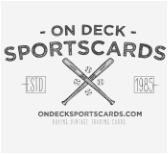 If you are looking to buy or sell sports memorabilia and collectibles, look no further than On Deck Sportscards in Lawrenceville, GA.
We have a large selection of PSA/DNA and JSA certified autographs, including certified trading cards, jerseys, pictures, books, and framed pieces. We are always looking to buy sports memorabilia as well, so let us know what you may be looking to sell!